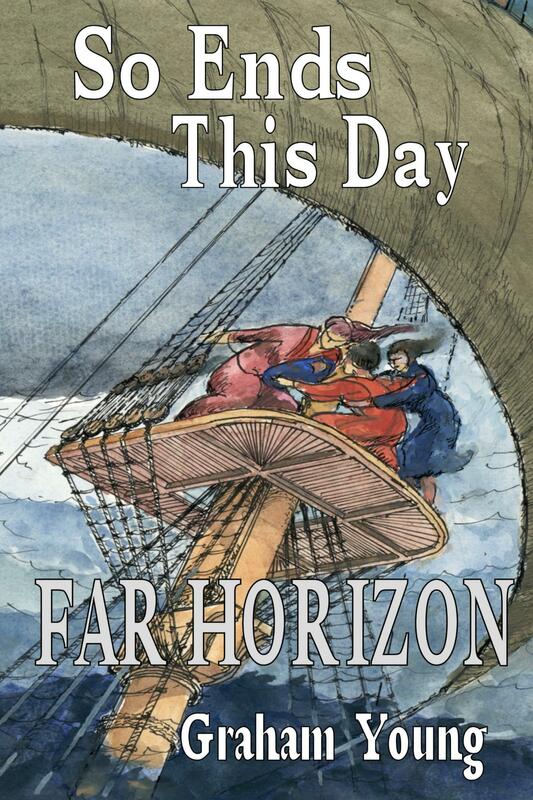 “Far Horizon” is the first book of the “So Ends This Day” trilogy, a story of a struggle to survive. In the year 1819, a full rigged Indiaman of American registry, heavy laden with riches from the Indies, drives ashore in a roaring gale and wrecks on the string of barrier islands known as Cape Hatteras, “Graveyard of the Atlantic”. Sinking in the shallows, masts still above water, crew clinging to the rigging, three women and a babe in arms are safely secured together in the rigging of the main top where drenched by lashing rain they can only pray for help. Time and again rescue attempts launched by local fishermen are thwarted by raging seas and thundering surf while those on shore watch helplessly as one by one the crew are swept from the rigging to smother and drown before ever reaching shore. Only the three women in the main top remain above water slowly perishing of cold, hunger, and despair until as the storm dies only the half-drowned infant is left with bare life enough for saving. From this near death experience comes a struggle for survival of a nameless, destitute orphan revived by miracle and reared in an orphanage as a “foundling” of unknown origin. Toughened by his misfortunes and seeking only to establish a peaceful and respected slot for himself in orphan hierarchy, he becomes an innocent victim of lies and intrigue resulting in a violence so disruptive to the institution he is banished to allow for a cooling off period and sent on an impossible project that becomes a mission of danger ending in accusations of murder he did not commit. Fleeing from the law with a price on his head he is reluctantly accompanied by a runaway slave who reasonably believes escape more easily achieved on his own than with a useless white boy lacking in any experience or ability to live off the land. Faced by the risks and dangers of escape the two are forced into an uneasy collaboration, which gradually transforms into one of mutual reliance and respect forming an unbreakable bond as they struggle together to gain their freedom. Telling it like it is in his own words the orphan takes the reader with him under fire, on narrow escapes, and the ceaseless searchings of woods and shorelines for enough wild food to sustain life. Without attempts at excuse, speaking directly to the reader the orphan hopes for a sympathetic hearing and a better understanding of the paths he is forced to take. 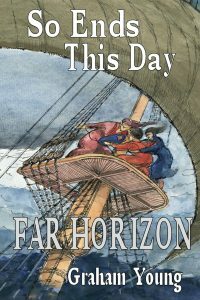 For a limited time we will be offering willing participants a free copy of "So Ends This Day: Far Horizon" in E-book format from Smashwords.com. From Smashwords.com, you can download the book in any format it is available, which is most acceptable formats. This will be in exchange for your review of the book at Smashwords.com (or another online retailer of ebooks that is currently selling it is also acceptable). We will need your name and email address to provide you with the coupon code. This will only be handed out to a few people so Contact Us today!